For nearly a decade, the Social Justice Coalition (SJC) has been working to realize the rights of marginalized citizens of Khayelitsha, a community on the outskirts of Cape Town, South Africa. Over the past several years, the group has focused on dignified sanitation, advocating for the provision of adequate and permanent infrastructure rather than the proliferation of temporary toilets that have been the city’s preferred approach to the issue. As the sanitation issue has become increasingly visible and so more political, revealing the deep exclusion still prevalent in post-Apartheid Cape Town, SJC has had to navigate a treacherous landscape of engagement with authorities. Analyzing the municipal budget and mobilizing citizens to engage in the budget process has grounded the group’s advocacy in something specific and concrete and has enabled them to maintain a clear focus on their goal. 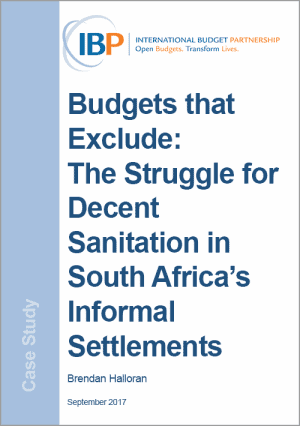 Even as their core demands for safe and sustainable sanitation remain unmet, SJC’s members have made gains of other sorts, both in the improvement of services and in the encouragement of active citizenship by excluded groups. This case study demonstrates that pro-reform actors need to develop diverse capacities, strategies, and approaches in order to navigate what is often a weak accountability ecosystem.